Each summer I wonder if the UK’s new-found love affair with rosé will run out of steam. 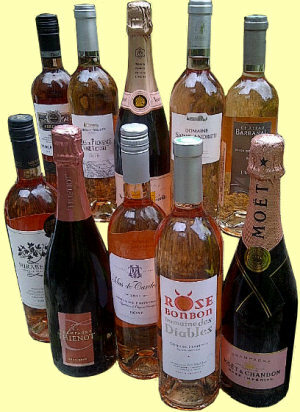 Well, if the number of rosés being sent to me as samples or appearing in the summer tastings from major UK retailers is anything to go by, the answer is no. All we need now is the recently changeable British weather to play ball, and another bumper summer for pink wine seems to be on the cards. In this 32-bottle rosé salute to summer I’ve gathered the latest crop for a seasonal round-up of some of the most interesting examples. July and August always throw up a clutch of promotions and discounts on the pink stuff too, so happy hunting. A blend of Chardonnay and Pinot Noir from the chalk slopes of Hampshire, this new label is a project by Christian Seely, Managing Director of Axa Millésimes and his friend Nicholas Coates, a retired City executive. Soon a blanc de blancs and possibly other cuvées will join the portfolio, but this first release for July 2011 is already causing a stir, not just because of an excellent reception for the quality of the wine, but because the pair have proposed ‘Britagne’ as a new generic term to describe British sparkling wines, much like the French have ‘Champagne’. I have just tasted this wine and thought it was quite beautiful, with a gossamer light construction, pale in colour with scents of rose-hips and strawberry, but a fabulously vibrant palate which teases with sweet fruitiness and its very fine mousse, before ravishing acidity through to the finish. One of the great English sparkling wines in its first release. 92/100. £29.95, Lea & Sandeman. The cheapest wine in the line-up this year is a little beauty, made from Cinsault and gently off-dry with 8g/l of residual sugar, but that expresses itself as a fruity, creamy raspberry and strawberry sundae wine that slips down a treat in the sunshine with its pleasing acidity and modest 12.5% alcohol. 85/100. £4.99, Majestic. And the second least expensive pink hits the spot too. From the Languedoc’s Pays d’Oc, it has a nice pale peach colour and quite refined redcurrant and raspberry fruit. The palate is dry and balanced, with a little creamy weight too. 85/100. £5.19, The Co-operative. With only 11.5% ABV this is the lightest still rosé in this year’s haul, the canopy of the vines in the Colchagua Valley managed to shade the fruit from the fierce Chilean sun. There’s a touch of herby tomato-leaf, but plenty of red fruit too. On the palate this is soft and easy, with some residual sugar playing against the slightly green streak of the fruit. 85/100. £6.99, 2 @ £5.59 until end August 2011, Majestic. This is a new wine for the Co-op, that will be in stores from August 2011. With a fairly deep cherry tinge to the colour and 12.5% ABV it has a very inviting creaminess to the soft, pulpy berry fruit on the nose. The palate is flavoursome too, with lots of mouth-filling fruit, nicely balancing acidity and a robust nip of tannin in the finish. Good value. 86/100. £5.99, The Co-operative. This has a lovely herbal and cherry freshness on the nose, with immediately delicate notes hinting at flowers. The palate is fresh as a daisy, but fruity and with a certain mouth-filling creaminess too. £6.95, The Wine Society. A Cinsault wine from the French south, this has quite a deep cherry colour and attractively floral, rose-hip and raspberry brightness on the nose. On the palate there is considerable sweetness, and whilst it is full and rich, a little more crunch and less sugar would have earned an extra point. 84-85/100. £6.95, The Wine Society. 100% Garnacha (Grenache) with a very deep, light red wine colour. Creamy berry fruit, with a certain earthiness. The palate has fullness and a hint of sweetness, a jammy richness of fruit that is crowd-pleasing. Balanced acidity, but a big, creamy off-dry style. 85-86/100. £6.99, Tesco. This Pays d’Oc Rosé from vineyards between Montpellier and Narbonne has a bold cerise colour and cherry bubblegum aromas. With 13% ABV and bottled in screwcap it is a modern, up-front style, the fruit on the palate being full and ripe, with juicy sweetness and plenty of zip into the finish which shows a touch of spice. 85/100. £6.99, Waitrose. Medium, purple-pink colour, a blend of Grenache and Syrah with a slightly pear-droppy, cold-ferment character that is a tad anonymous, though a little cherry and raspberry comes through. On the palate this has a fruity personality, with soft strawberry and raspberry notes, and good balancing acidity. 85/100. £6.99, Tesco. Made for Tesco by Catena, this 13.5% ABV rosé has a zingy colour and fresh, vibrant nose, the zingy berry fruit tinged with a green streak, some floral notes and plenty of character. The palate is equally bold, full-flavoured and attractively robust, with a bit of tannin and grip giving this foodie appeal: even match with lighter curries and meat dishes. 87/100. £7.49, Tesco. From Campo de Borja in northeast Spain, and made by Scottish winemaker Norrel Robertson. This has a medium and very pretty pomegranate colour, and a small proportion of barrel fermentation adds a touch of creaminess and softness to the strawberry fruit. The palate has a rounding weight of fruit, with a nicely tart raspberry edge and quite a full, textured and mouth-filling finish. 88/100. £7.49,Waitrose. A 50/50 blend of Grenache and Syrah, from an estate that has moved to sustainable agriculture with less reliance on synthetic sprays and chemicals. Pale- to medium and softly peachy in colour, it has a clean, fruity nose with a touch of pear-drop, but the fresh summer fruit coming through. On the palate a nicely dry and herby nuance, with a hint of leafy endive, adds nice bite to the soft, fruity flavours. Well-balanced with the lemony acidity, this has a freshness too. 86-87/100. £7.99, Waitrose. Lots of boiled sweet, though attractive fruit in this screw-capped wine, with hints of cherry and lemon sherbet. The palate is dry, with racy acidity, though this perhaps lacks the finesse of the finest Provence examples, but drinks very nicely. 87/100. £7.99, Tesco. From Lujan de Cuyo in Mendoza, a blend of 60% Malbec with 40% Merlot that has an attractive, quite deep peachy-pink colour. The nose is quite vinous and serious, not giving terribly much, but with a savoury, earthy character. On the palate a sweet fruit profile emerges, with a touch of strawberry and hint of peach, with the acidity cutting in a touch abruptly perhaps, though that does add to its savoury, food-friendly grip. 85-86/100. £8.99, Sainsbury’s. The best news about this Pinot Noir rosé is that it is in Bibendum’s sale, which runs July 19th – August 1st, reduced to £7.71. It has an invitingly pale salmon colour, and an appealing nose with a touch of pomegranate and redcurrant, and a glimpse of earthy Pinot quality. On the palate it has a very nice fruitiness and weight, and a bit of tannin and power (this has 14% ABV), with spices and a certain richness playing against good, tangy orange fruit and acidity. 88/100. £11.83, Bibendum.